A Drop-In Slatted Bed Bases is designed to fit neatly within your bed frame. You would keep your existing bed frame and simply change the bed base to give your bed frame a new life; you can completely change the support and comfort of your bed with a Drop-In Slatted Bed Base. Our Drop-In Slatted Bed Bases are designed and Manufactured in-house in our Workshop in London, UK. Our bed bases are manufactured to a high standard and sold exclusively by us, each bed base is made to the customers exact requirements. Our slatted bed bases are fully assembled and ready to Drop-In to your bed frame when delivered, either in one frame or two frames depending on the size of your bed. Please note all slatted bed bases are manufactured to order, you will be required to inform us of the internal dimensions of your bed frame; as this will be the maximum area available for your slatted bed base to sit in. It is a good idea to take a 4-5 millimetres off the total exact size to ensure the bed base fits comfortably within your frame. All our Drop-In Slatted bed Bases consist of beech sprung (curved) bed slats; the frame structures are manufactured from either Beech Ply Multiplex or Solid Beech. these premium materials are undisputedly the preferred material in the industry. All our bed bases are also connected together via Furniture Connector Bolts and Metal Cross Dowels which is the strongest and most robust connection. It far exceeds the connecting system used by our competitors. Even though mattresses have standard sizes; bed slats and Slatted Bed Bases vary in size from manufacturer to manufacturer. Therefore we do not stock standard sizes. Our Slatted bed bases are suitable for UK, European and American bed sizes. Please take the time to carefully measure your bed before ordering. Our Standard delivery time is approximately 10 working days, however we are also able to offer an express 5 working day or 3 working day service. - the Width and Length you require; there is NO standard size. - how the bed base is delivered and is it fully boxed? What is a drop in slatted bed base? A Drop-In Slatted Bed Base is designed to be dropped within your existing bed frame to support for your mattress. All our Slatted Bed Bases use Beech Sprung Bed Slats. Do you offer Standard sizes or are all your bed bases made to order? There is no standard size when it comes to Slatted bed bases. It is always best to measure your actual bed frame before ordering. Bed Bases will be larger if the mattress is sitting in the bed frame, smaller if the mattress is the same size as the bed frame. What material are your slatted bed bases made from? 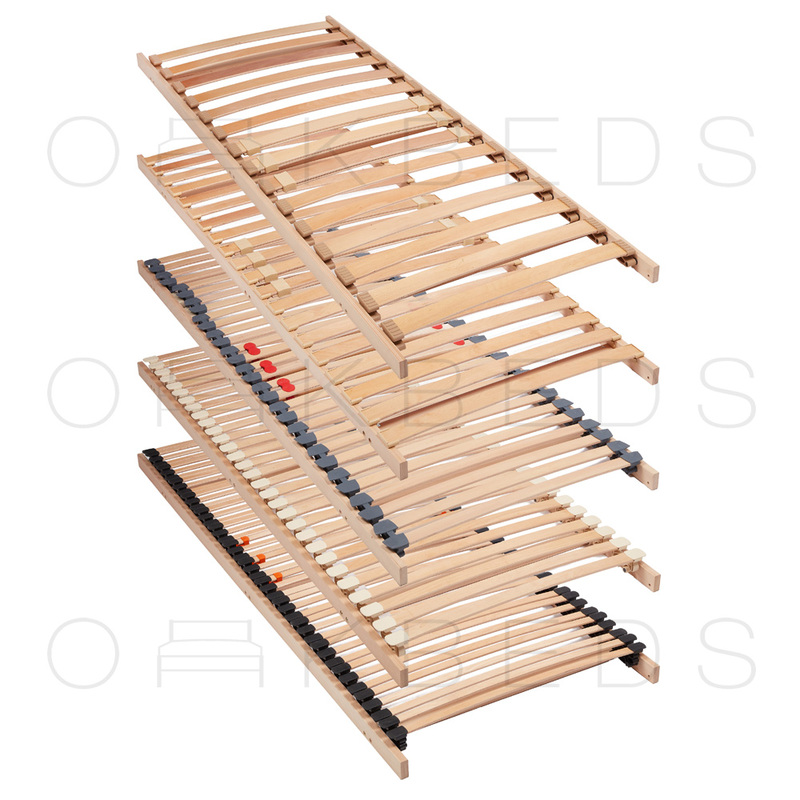 The structure of our bed bases are made from either Beech Ply Multiplex or Solid Beech. We strictly only use Beech Sprung Bed Slats. These premium materials are undisputedly the preferred material in the Bed industry. Do i require a bed centre rail? All Double Row Slatted Bed Bases require either a Centre Rail or Cross Rails. These are structural parts on the Bed Frame that are designed to take the weight of the Mattress and Sleepers. What is the different between a Centre Rail Kit or Cross Rails? A Bed Centre Rail runs down the length of the bed frame; from head to toe. A centre rail would need to be used with Support Ledges. What are the differences between your slatted bed bases? Please click the link "Compare all Standard Bed Bases"
Will a slatted bed base be suitable for my mattress? Our Slatted Bed Bases are generally suitable for most Mattresses. We would recommend asking your Mattress Supplier to confirm the maximum gap in-between the slats. How will they be delivered and is assembly required? We have custom made packaging made for all our slatted bed bases; allowing us to deliver nationwide via the National Courier Network. I have limited access, will they fit into my room? Our Drop-In Slatted bed Bases are Fully Assembled on delivery. If you purchase a double row bed base; they will come in two sections. You are able to dismantle and reassemble them if needed. How do I measure so that the bed base will fit? We manufacture all our Slatted Bed Bases to order. We will manufacture them to the expect size you specify. Please ensure you take off a small tolerance of the exact internal size of your bed frame. We recommend 3mm - 5mm off the total length and width. 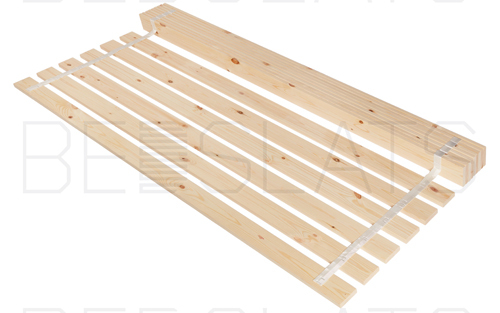 You want to ensure our slatted bed base fits within your bed frame. A snug fit is ideal. Are wooden slatted bed bases better than metal? Yes, metal slatted bed bases are generally mass produced. They also seem to have a low number of sprung slats; meaning the gap in-between the slats are fairly large. Most of the Metal bed bases we have come across also tend to use Birch or Polar Slats. It is also very a hard to get these in custom sizes; so most bed manufacturers compromise the quality. Why don’t you have webbing in the middle? A Fabric belt down middle of the slatted bed base is meant to help distribute the weight of the sleeper. However this is a very old technique that is no longer used by Premium Bed Base manufacturers around Europe. We see this technique generally used on most cost effective bed bases that use Birch Slats.